NARS sheer glow in mont blanc: here. this foundation was bought with a slightly raised eyebrow. as someone who has never been confident with her combination skin, i was questioning why i was buying a product with the words ‘sheer’ and ‘glow’ in the title, but it was proven to be the right decision. it’s certainly not sheer (medium, i would say) and doesn’t emphasise oil, as it just gives a natural look to the skin. will definitely repurchase again and again. estee lauder double wear in shell: here. EL had stupidly discontinued this shade, ie. the only shade i can wear, which i think is a) mental and b) unfair to us pale girls, but rumour has it they’re bringing it back! pale girls rejoice. 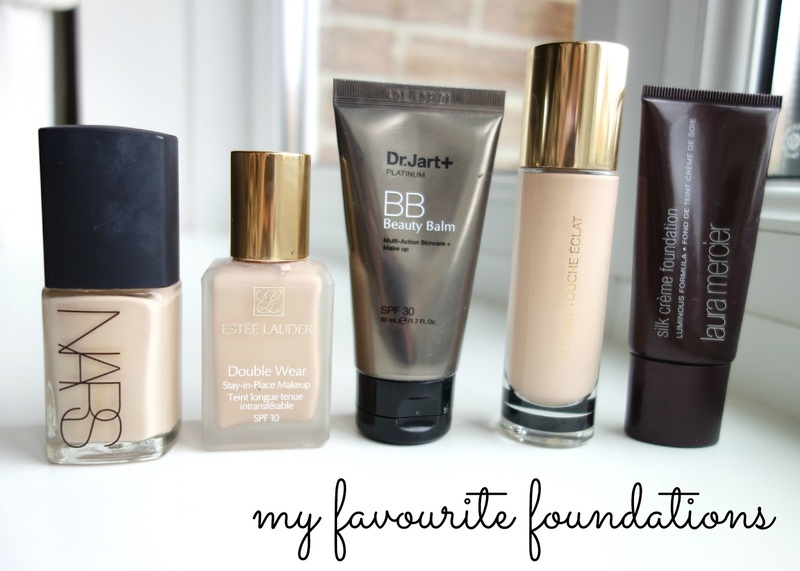 anyways, if you like your foundations to go up to full coverage, then this one is for you! i tend to wear it on nights out and the stuff does. not. move. it really is fantastic for staying in place. dr jart platinum beauty balm: here. as i’ve said before, i thought BB creams were for those with immaculate skin, but my mind was changed when i sampled this little beauty in boots. it’s insanely thick when it comes out the tube (and smells like chocolate orange), but doesn’t sit heavily on the skin. it looks a little darker in the swatch below, but with a bit of powder on top, it looks totally fine on me. YSL le teint touche eclat in BR10: here. the first time i ever tried this foundation i liked it… for about an hour. after that i felt like it settled into pores and emphasised them so much. but, as i was determined to make it work, i have come to love it. when applied with a primer underneath and a dusting of powder, it sits much nicer when i’m having ‘good’ skin days. definitely a lighter coverage than i’m used to, but still a good’un in my books. 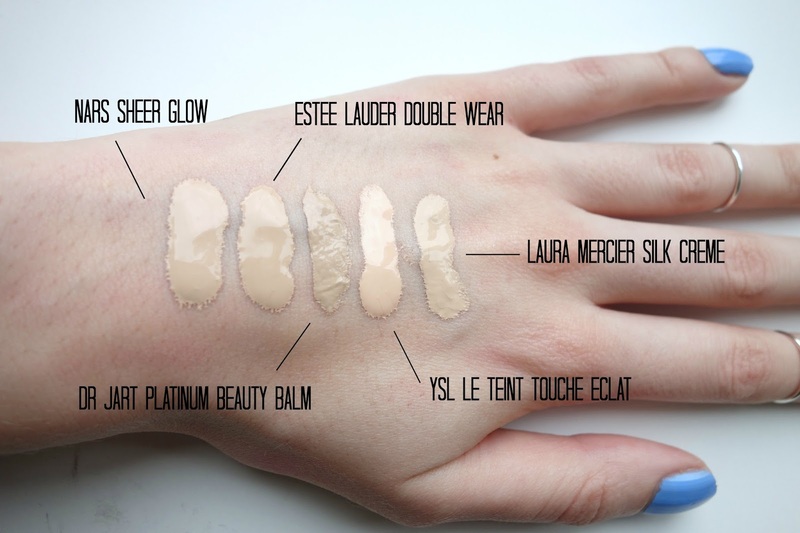 laura mercier silk creme in soft ivory: here. now, this one might be closer to HG status than the others. it always applies evenly, blends beautifully and offers great coverage (up to full, if you want it). reckon is probably my most used and loved over the past 9-12 months and i’m not even near finishing the tube yet. great value for money and all that, well worth the investment! let me know what you think about my makeup series idea! what you would like to see next? oh and what’s your favourite foundation? ps. check out the lovely olive and frank for beautiful jewellery and clothes. oh and my giveaway ends this sunday! get entering here.